While this side dish you can absolutely use in replacement for apple pie (you won't miss the traditional pie either! ), it's honestly just delicious to have on hand as a snack or mix with homemade yogurt or served on top of oatmeal for breakfast, pictured below. Either way, this recipe is so delicious and easy you will never get tired of making this! In a 9x13in baking dish, add the apples and sporadically place the cubes of butter and bits of coconut oil in between the apples. Cover with almonds, coconut, cinnamon and sea salt. 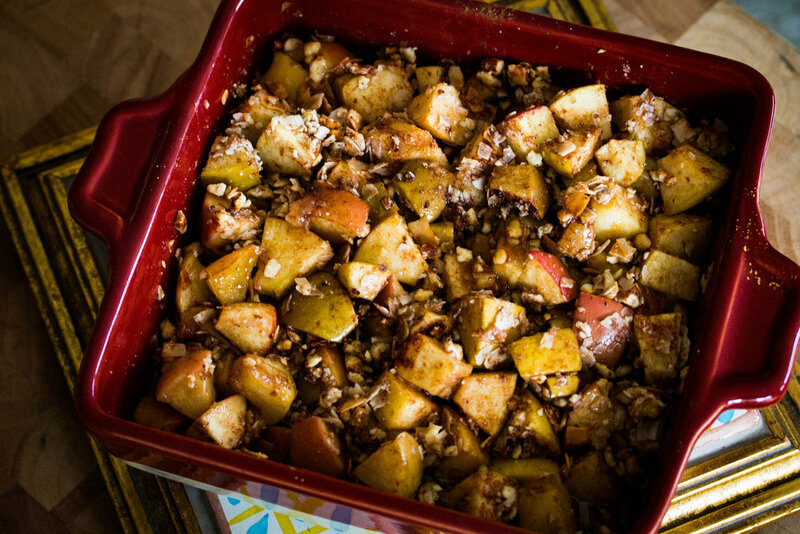 Drizzle with honey and bake for about 30 minutes until apples soften.